reproduction of the 1903 Wright Flyer. The First Flight Foundation is proud to sponsor this gifted speaker and long-time friend to champion the legacy of the Wrights. A native of Manteo (Roanoke Island), NC, Collins is recognized as one of the world’s top 5 experts on the Wright brothers and early aviation history. 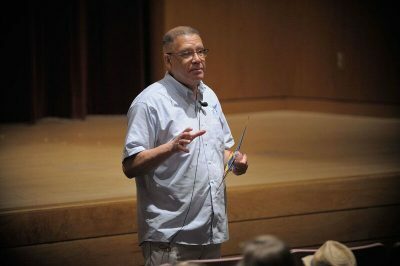 A 37-year veteran with the National Park Service, Collins has represented the NPS and Wright Brothers National Memorial nationally and internationally speaking on the Wrights’ work and legacy. He has worked with authors, researchers, and play-writes to ensure historical accuracy of the Wrights and their work. Collins has been active on the Aviation/Aerospace Lecture Circuit, nationally and internationally; a regular speaker at the “Speakers’ Showcase Series” of EAA’s annual fly-in-Oshkosh and Sun n’Fun; National Air Transportation Association; Flight Safety International; Aerospace Industry Association of America; Alaskan Aviation North Expo; and Australian International Air Show. He is a five-time speaker at the Washington DC Aero Club Wright Memorial Dinner (presentation of the Wright Memorial Trophy). Collins’ recognition includes: the ROTARY INTERNATIONAL – Paul Harris Fellow award; the President’s Award-Experimental Aircraft Association; the Paul Tissendier Diploma from the Federation Aeronautique Internationale; and honorary membership of the Virginia Historical Aviation Society. The State of North Carolina presented Collins the Order of the Long Leaf Pine on the floor of the General Assembly. History is not merely a profession and passion for Collins. It is heritage. Through maternal lineage, Collins is a descendant of the Freedman’s Colony which settled on Roanoke Island in 1862. His paternal ancestry is traced to the Native Americans of Roanoke Island; he is a member of the Roanoke-Hatteras Native American Tribe. Collins is a proud graduate of Elizabeth City State University. He serves his community as a commissioner and Mayor Pro Tem of the Town of Manteo and is the chairman of the Pea Island Preservation Society.